Home Uncategorized Mediocrity or parity? It’s definitely not mediocrity. This is probably the best-skilled WNBA we’ve ever seen, as showcased in the All-Star game. It’s some serious parity, as all of that talent is spread out amongst the league’s 12 teams. ….are Ivory Latta for the East and Maya Moore for the West. Maya Moore has become the face of the league. ….have signed Waltiea Rolle to a second seven-day contract. Eye of the Storm: Tanisha Wright. Ivory Latta discusses a recent cancer scare. 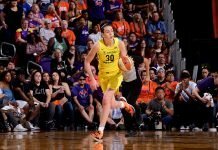 The WNBA most definitely does not suffer from a lack of quality players … and within five years I truly believe every team will be sporting a squad like the current Mercury in terms of size and skill. Not all will have a Griner, but the sub-six-footer is rapidly becoming obsolescent. They perhaps could schedule it during the opening weeks of the NBA season — maybe play the championship match on Christmas Day when live hoop is on the tube from sun-up to sun-down. Heck, I think I would have enjoyed an O. Sims vs. J. Loyd battle more than the Baylor/ND tournament game last season.